Lyle Huff, age 86 of Boone, died June 24, 2018 at the Accura Healthcare in Ogden. Funeral Services will be Saturday, June 30, 2018 at 10:00 a.m. at the Church of the Sacred Heart in Boone. Following the service, Lyle will be cremated and a private family graveside service and burial of his cremains, will be in the Sacred Heart Cemetery. Lyle Elwyn Huff, was born July 13, 1931 in Sexton, Iowa, the son of John and Ethel (Baker) Huff. He graduated from Wesley High School in Wesley, Iowa in 1949. Lyle enlisted with the United States Air Force. On June 28, 1956, Lyle married Ramona Reising at St. Joseph’s Catholic Church in Wesley. Before his military service, Lyle was an ‘over the road’ truck driver for Ronnie Newbrough Trucking in Wesley. While living in Boone, he was a route man for the former Carlson’s Lindsay Water Conditioning in Boone, worked as a security man at the Ames Lab in Ames, and was a builder at Sadler Built Homes, formerly in Boone. 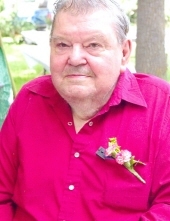 For 21 years, Lyle was a warehouseman for Fareway Stores in Boone. He and Ramona enjoyed camping at Cutty’s in Des Moines and he enjoyed watching television. Lyle also enjoyed playing brain games puzzles, reading Mother Earth News, listening to Paul Harvey, and planning and developing inventions on paper; though none of them were patented. Lyle was a member of the first Boone County Freedom Flight in 2015. He is preceded in death by his parents, wife, a daughter Kathleen Hurt, granddaughter, Beth Huff two brothers, Eugene and Andrew Huff. Lyle is survived by his sons, Tim (Julie) Huff of Boone and Larry (Sherri) Huff of Des Moines; daughters, Patricia (Jeff) Roll and Debi (Christopher) Zeitler all of Boone; seven grandchildren, Sarah Roll, Shannon (Kevin) Ferguson, Jesse Roll, Ryan Hurt, Nate Hurt, Rhiannon Walker, and Michael (Casey) Huff; seven great grandchildren, Riley and Emma Lynn Hurt, Wyatt and Ayla Walker, Alexia Hohenshell, John ‘J.J.’ Huff and Isabella ‘Bella’ Hohenshell. Friends may call at the Schroeder-Reimers Memorial Chapel on Friday from 4 until 7 p.m. where the family will be present from 5 until 7 p.m. Visitation continues on Saturday at the Church, from 9 a.m. until service time. In memory of Lyle, memorials may be directed to the family. To send flowers or a remembrance gift to the family of Lyle Huff, please visit our Tribute Store. The family will be present from 5-7 pm. Visitation will begin at 9 am until the time of service at the Church. "Email Address" would like to share the life celebration of Lyle Huff. Click on the "link" to go to share a favorite memory or leave a condolence message for the family.